Looking for an easy, automatic and cheap way of keeping your important data on your computer backed up? Looking for an easy way to recover your data anytime from anywhere if disaster strikes? Hard drives do fail, data recovery companies charge a very expensive price for data recovery. Data recovery from these companies is not guaranteed. 50% of the computers repairs come in here with bad hard drives. 98% of these failed drives customers do not have any backup and have lost all there photos, documents and critical non replaceable data. Depending on the damage to the hard drive and how much data they are able to recover. Could you afford to lose ALL your important data? Family photos, family videos, photos of your kids first ball game, school reports, documents, tax documents from Turbo Tax, music collection, password stored in Keypass vault, serial activation keys for software. Offsite data backup using iDrive is very easy. Simply register an account, download there software and install and backups start immediately. That is all you have to do! Your computer data – photos, documents, music, videos are uploaded offsite to your account with a iDrive automatically everyday when computer is on and connected to the internet. iDrives software checks your folders and data for anything that is added or updated on your computer and backs up automatically. If your computer or laptop is stolen, your house burns down or hard drive fails your data can be recovered via downloading either thru there website, there software or from another computer once signed into your account. 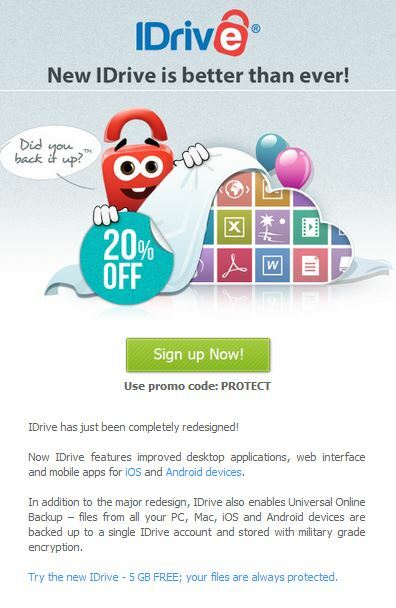 With iDrive you’ll never have to worry about losing your important critical data again! iDrive starts you off with a FREE 5 gigabyte offsite automatic backup account, completely FREE! Just register, install software no payment needed! FREE 5 GB account with no expiration date! iDrive can be upgraded to 150 GB storage space if you need more storage backup space at anytime. iDrives regular subscription plan is only $49.50 yearly cost, breaks down to $4.12 per month, .13 cents per day! DO NOT wait till it is to late! Sign up with iDrive TODAY! I’m planning on using this IDrive. As it has a lot of interesting features than what I am using now.